Spectators watch a church procession pass through the Churchgate area at the bottom of Silverwell Street. 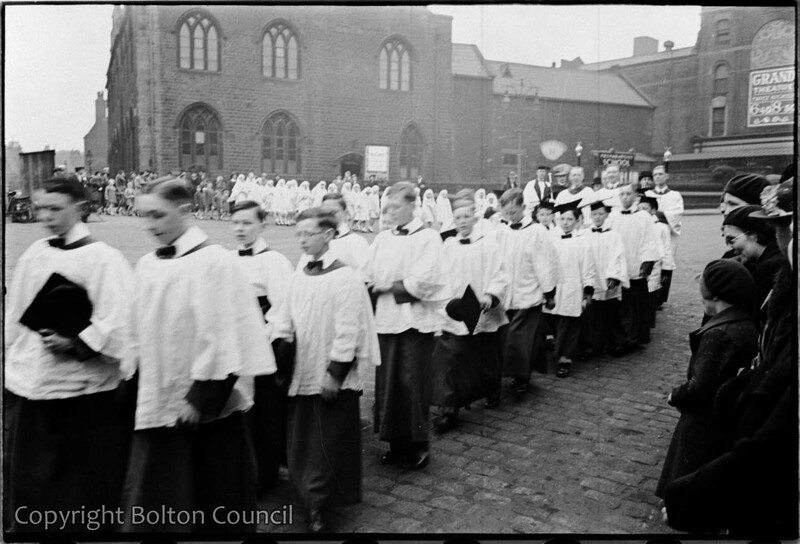 At the back of the photograph are the Grand Theatre and Bolton Church of England Preparatory School for Girls. Can anyone tell me if St Peters was regarded as ‘High Church’ please? My father, John Barlow used to sing in the choir in the 40s/50s, and I have some pictures of him all dressed up and part of a parade. It was,I think, high church. We went there in the 50s but then changed to a church in town ( Kings Hall ?) when a pal of my dad became vicar there. St. Peter’s was built as a cathedral so I think it would have been regarded as ‘high’.